A Complete Starter Kit With Everything You Need to Grow 5 Rare Veggies From Seed - No Past Experience or Additional Tools Required! ❀ PURPLE CARROTS - same taste, cooler color. ❀ BLACK / BLUE CORNS - the hippest corn in the block. ❀ ROMANESCO BROCCOLI - nutrients boost packed in a FUNKY shape. ❀ MULTI-COLORED SWISS CHARDS - makes an awesome rainbow salad with red, yellow, white, green, violet, orange, gold & pink stems. ❀ LEMON SHAPED CUCUMBER - your typical cucumber, in a costume. - 5 BIODEGRADABLE POTS made from coconut coir. 100% natural & organic. can be planted directly in the ground. - 5 Compressed peat moss SOIL PELLETS - potting soil expands by 7 times when watered. - 5 PALNT LABELS - keep track of your plants progress. - Step-by-step INSTRUCTIONS - also sent via email. ✔ High germination rates - all the seeds are open pollinated and packed in high quality heat sealing foil seed packets to allow long term storage. ✔ Great for beginners & experts. Everyone can easily start planting and growing these funky vegetables. ✔ Original and thoughtful present for males and females, adults, children or seniors, amatures or professional gardeners. 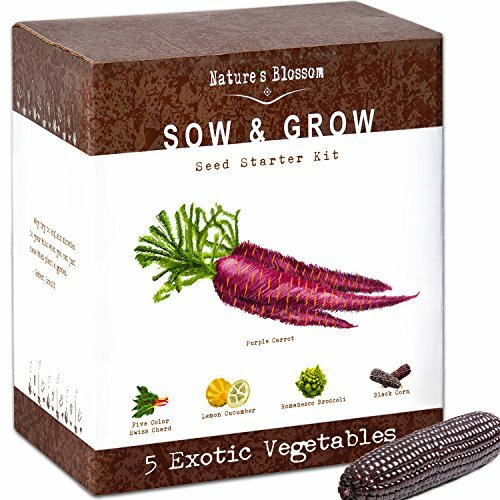 GROW 5 UNUSUAL VEGETABLES FROM SEED - Our kit offers an exciting selection of distinctive & funky edible vegetables: purple carrots, black corns, rainbow swiss chards, yellow cucumbers & romanesco broccoli. 100% SATISFACTION GUARANTEED. EVERYTHING YOU NEED IN A BOX - This Gardening kit arrives with all the tools & equipment for growing an exotic veg garden at home: Instruction Manual w/ essential growing tips; 5 seed packets, 5 biodegradable planters; 5 soil discs; 5 plant markers. GARDEN GIFT FOR BOYS & GIRLS - Nature's Blossom's colorful vegetable kit is a unique gift idea for beginners or experts, men, women & children. Popular DIY gift for christmas, holidays, kids birthdays & school events. GREAT INTRODUCTION TO GARDENING. Teach your kids the basics of gardening and growing plants the fun way. With high germination rate seeds, growing a spectacular veg garden has never been easier. Can be planted indoors or outdoors.